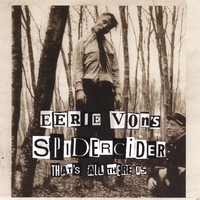 Eerie Von (Danzig, Samhain) returns with a garage punk band, SpiderCider and a killer album, That's All There Is. This CD sees Eerie returning to his early roots to produce a punk tinged garage rock masterpiece. Eerie Von, founding member of Danzig and Samhain is back with his first new work since 2004s Bad Dream No. 13(Ghastly Records, GR03). This CD sees Eerie returning to his punk roots and is a departure from his last three releases. It is a Garage/Punk collection; 10 tracks of pure Eerie madness! It was completely written, recorded and produced by Eerie at his home studio. SpiderCider is a new direction for Eerie (or a return to his early roots and influences) and is sure to earn him many new fans as well as completely satisfy his legions of existing fans. Fans of Johnny Thunders, Joey and Dee Dee Ramone will be pleased with this upbeat classic punk style CD. CD Baby gives phenominal service! Thank you CD Baby. Eerie Von comes from a long history of Punk Rock, with his past with Rosemary's Babies, Samhain and later with Danzig. Von as already released 3 other CDs since leaving Danzig. But Spidercider is a return to his Punk roots. If you are a fan of old school punk rock then this is a CD that you should be picking up. Excellent album - back to the roots! Thank you Eerie. Thank you CD Baby.